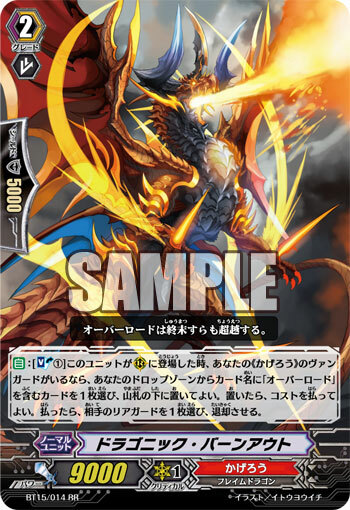 [AUTO]:[Soul Blast (1)] When this unit is placed on (RC), if you have a «Kagerō» vanguard, choose one card with "Overlord" in its card name from your drop zone, and you may put it on the bottom of your deck. If you do, you may pay the cost. If you do, choose one of your opponent's rear-guards, and retire it. "The Overlord transcends even the end of days." A demonic dragon with sword-horns that follows those with the title of “Overlord”. He’s a warrior who shares the same lineage as the hero “Dragonic Overlord”. When that his clan has the eternal fate of serving as the swords and shields of the “Overlords”, he was furious. Even if this Overlord was a General, why should his clan, the Demon Dragons, who possess incredible power, bow down to some lowly mere warrior? His fury and anger at the situation exploded in the worst way. Ignoring the orders of the veteran, he lead a surprise attack on this “Overlord” with like-minded allies in the middle of an encampment. But of course, they ended up getting their asses kicked. While he should of been sentenced to spend half his life in prison, “Dragonic Overlord” said he was forgiven and left as if nothing had happened. Dragonic Burnout realized he could never cross the chasm of absolute strength that lie before him and The Dragonic Overlord. The master of the Demon Dragons was decided there and then, in Burnout’s mind. His reason for being has since become serving as the sword of the strongest being alive. He no longer regrets this fate he has been shouldered with.